There are just some characters in the Bible who make you shake your head and remark, ‘what a man’. David, despite of his super high-profile sin, was such a man, to the extent that in the reign of his son Solomon, who did evil in the eyes of the Lord [1 Kings 11:6], God had mercy on Solomon, ‘for the sake of your father David’ – Nevertheless, for the sake of David your father, I will not do it during your lifetime. I will tear it out of the hand of your son. “Yet I will not tear the whole kingdom from him, but will give him one tribe for the sake of David my servant and for the sake of Jerusalem, which I have chosen.” [1 Kings 11:12-13]. We see the extent of how highly regarded by God in his lifetime – he was a man who was after God’s heart [Acts 13:22], and he never forgot to come before the Lord, even when he fell. So when a man like this meets his deathbed – oh, let’s not forget that he’s a King – what does he tell his son? It’s a maxim we all love saying. In today’s study, we will examine the words that David said to Solomon as he was about to die, and understand why it means so much more than it seems at first glance. “I am about to go the way of all the earth,” – Don’t ask me why they talk like that. They were ancient people after all, so they speak in an ancient way. To go the way of all the earth basically just means death. It’s probably just like how some people frown at you saying ‘He died’. They’d rather you say, ‘he passed away’. Is there a difference? Not really, just sounds more packaged. The way of all the earth was a path that all men must pass through – whether you are a commoner, or a king like David, whether you were a good man, or a crook; whether you loved God or loved evil, whether you were rich or poor, high in status or low in society; healthy or unhealthy. There are no exceptions (well, except for those who famously got lifted up to God). This is a divine law of God – men of the past and men today have tried desperately to beat this rule, but to no avail – death still catches up to them. It is a natural law that none can hide from. We know that David didn’t create this phrase himself – Joshua had said it before [Joshua 23:14] while on his deathbed. Perhaps by David’s time the book of Joshua was already written, or perhaps this phrase is simply a common one in those days. So be strong – This is rather unfair of David, I think. Solomon was (supposedly) but just 12 when he died. If he had been an adult, or in his 20s, it makes sense to tell him to be strong, but a 12 year old boy? Come on, let him cry and weep and be weak! But okay, this is David, a king and a man after God’s own heart. This is Solomon, his most beloved son. Of course they lead different lives from us. Be strong – do not grieve for my death, for everybody dies, and should expect to die. Be strong – do not grieve because I am no longer around you, for God is with you. Be strong – do not show your weak side because you’re the next king, and you must lead the people. So be strong – note the ‘so‘ – because I am no longer around, you need to be strong and hold up the fort now. Keeping in line with the Moses – Joshua era teachings; this was something that Joshua was often told, and had often spoken about as well – Moses told him [Deu 31:7]; God told him [Deu 31:23]; and more [Jos 1:6-7; Jos 23:14]. If you do these, you will be acting like a man. While Solomon fell in his later days, we know he started off his reign very well, obeying the commands of his great father in keeping the law of the Lord and holding fast to the word of God. Ironically, in David’s line of logic on his deathbed, Solomon was probably a true man when he was yet a man, but not a true man when he became a proper man (by age). 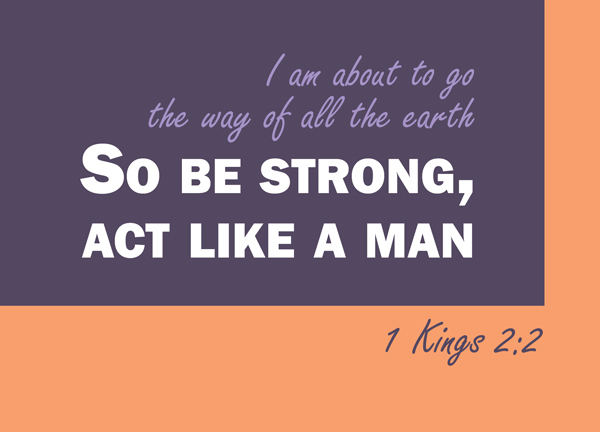 Act like a man – do the mature thing. Do the right thing. The next time you tell somebody to man up; or somebody tells you to man up, think about God instead. Do those few points that David suggested, and you might actually be able to man up.